Professionally Designed and Built in the USA. 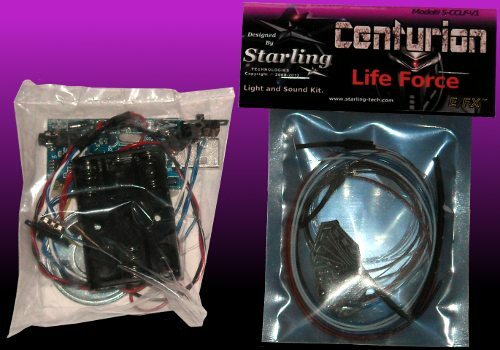 Starling Proudly brings to you the first ever, our completely awesome E/FX™ Centurion Life Force Plug-N-Play Light and Sound kit for the 1/6 scale Moebius Cylon Centurion. This amazing kit brings your Centurion to Life with red eye scanner, blazing machine-guns and firing rocket launcher with end explosion. One sound switch allows you to turn on/off the weapons and scanner sounds for when you're just not in the mood for sound effects. Guns go into action about every 20 seconds. No soldering or electronics skills required like other kits on the market. Simple intuitive design allows you to connect both wiring harnesses without a hassle. 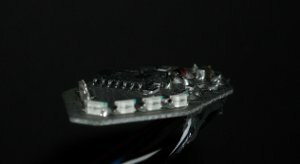 High resolution visor scanner via smd LEDs. No complicated soldering Required like other kits on the market. No need to tear apart your model to change batteries or turn the switch on/off. 1 x switch for power. 1 x switch to turn sound on/off. High quality circuits using the best quality components available. All kits are tested before shipping giving you the best quality control available. 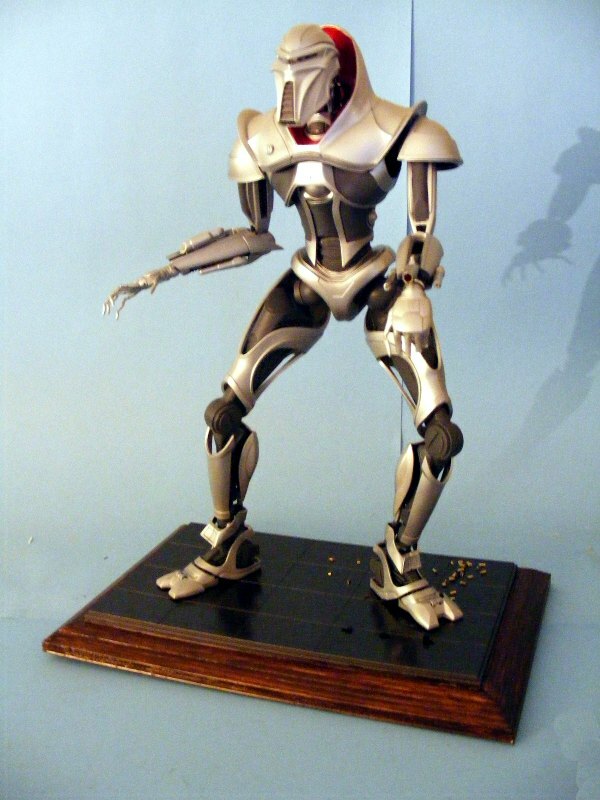 1 x Fully assembled cylon Centurion circuit with LEDs, sound board, and 2 wired switches. Sound board contains a 1/8" sound out jack that you may attach to a set of amplified speakers. 1 x Fiber Optics for the Three weapons. A custom base will be required to be built by the modeler to contain switches, batteries and sound board. Super easy intuitive kit for the modeler. Photo of my completed Centurion build. Note the expended brass casings at his feet. has been updated to 2. This kit is for those that do not want sound or gun lighting, only the visor effect.